Thanks very much for your company this evening. There may have only been one game, but there was enough excitement in that second half to keep my wee fingers going full pelt on the keyboard. Join us again on Saturday for a full programme of six Scottish Premiership matches. Martin Canning seemed to have been to swept up in the week's events, with Alex Neil joining Norwich City, to consider his future as a possible permanent manager of Hamilton. Next up are Celtic, who have been sunning themselves in Gran Canaria, at the weekend. Andrew Priestley: "Hamilton will be devastated to lose that game after rallying to comeback from 0-2. A killer punch." "In the first half, we didn't really turn up. The week maybe affected their performance and they looked a bit nervous. "But I couldn't be more proud of them the way they came back into the game and I am devastated for them. "I thought that, if any team was going to win it, it was us and we have lost a set-piece goal, which was disappointing. "I felt that I wasn't 100% to play the game and I think the two boys who came into defence did well." So Hamilton have not only lost their manager but also now an unbeaten home run of 10 games. However, BBC Radio Scotland pundits Allan Preston and Craig Paterson are united in suggesting that the way they came back from 2-0 to level suggests Martin Canning has what it takes to inspire as manager on a permanent basis. Ash Barkworth: "Gary Mackay-Steven would be an excellent signing for us and I don't think out of our reach." A hopeful Sheffield United fan there! "It's three points and I suppose that's all that matters, but we make things hard for ourselves. "We are exciting to watch and we were comfortable and had chances to make it 3-0, but we make it hard for our fans at times. "I am pleased at the way we came back and got the winner, which I thought we deserved. "We are the top scorers in the league, scored three and could have scored more." United's win takes Jackie McNamara's team into third spot, leapfrogging Hamilton and Inverness Caledonian Thistle. They are a point behind Celtic, although the reigning champions have two games in hand. Accies slip a place to fifth. "Accies were terrific in that second half and that typifies Hamilton for me the way they rolled their sleeves up, but overall United deserved to win it for me as McGovern had two or three excellent saves." "Martin Canning will be livid. Having worked so hard to get back into the game at 2-2, it is a nothing corner and a central defender gets a free header, which is absolutely criminal. It is a huge three points for Dundee United." Ali Crawford blasts wastefully well over the crossbar as the ball drops kindly to the Accies midfielder as United struggle to clear their lines. United are defending desperately here. Will Hamilton create one last chance and save their unbeaten home run, which is presently at 10 in all competitions? Kevin @Kevi1967: "What a great game for a Monday night. Can Hamilton get a point they deserve good game guys?" It certainly has been breathtaking stuff in the second half after a disappointing first 45. Player-coach Martin Canning sends himself on as a late sub and it almost signals another equaliser as Ali Crawford's inswinging free-kick evades the big defender's head and Radosław Cierzniak claws it over the crossbar. From the corner, Tony Andreu's powerful header is clasped by the goalkeeper. Nadir Ciftci smashes in a superb but ambitious drive from the edge of the Accies penalty box and goalkeeper Michael McGovern turns the ball over the crossbar at full stretch. From the corner, Calum Butcher heads just wide. Fine double save on his goal-line from goalkeeper Michael McGovern prevents shots from Stuart Armstrong and sub Chris Erskine extending United's lead. Goalscorer Ali Crawford is in the clear inside the United penalty box but squanders a chance to level by lofting the ball over advancing goalkeeper Radosław Cierzniak - and the crossbar! Sean Dillon rises above the Accies defence and the big defender bullets a header into the net from eight yards. Ahead of that goal action, there were five yellow cards in quick succession - Conor Towsend, Calum Butcher and Jarosław Fojut for United and Jon Routledge and Darian MacKinnon for Accies. Tony Andreu's through ball splits the United defence and, although Ali Crawford's first effort bounds off the body of Radosław Cierzniak, it spins out of the goalkeeper's reach and the midfielder hooks a shot into the unguarded net. Martin Glass: "GMS is too good, with too much potential, to go to a League One team. It has to be Championship or stay at Dundee United." Simon Boendermaker: "If GMS is moving south, I'd be surprised if it wasn't to a Championship side, Clough must be looking at an Accies player." Tony Andreu fires over on the turn when he should have found the target. The midfielder was clearly offside, but it is all Accies at the minute. Jesus Garcia Tena brings Accies back into the game with a quality goal that would grace La Liga in his Spanish homeland. The defender curls an exquisite free-kick past goalkeeper Radoslaw Cierzniak from 25 yards. Gary Mackay-Steven wins the ball just outside the Hamilton penalty box and sets up Nadir Ciftci, but the striker fires wastefully over the crossbar from a promising position. The news from the sidelines is that Accies left-back Stephen Hendrie went off because he was feeling unwell during the first half. Sub Louis Longridge has gone to right-back while Michael Devlin switched to the left - exactly where that second goal came from. Tony Andreu has been quiet for Accies and he doesn't make the most of a rare sight at goal as he fires well over inside a crowded goalmouth. Accies winger Dougie Imrie has recovered after a spot of treatment after awkwardly standing on the ball going into a challenge with Charlie Telfer. Stuart Armstrong, the scorer of the first goal, plays the ball first time behind the Accies defence almost straight from kick-off and Gary Mackay-Steven neatly flicks it past goalkeeper Michael McGovern from 15 yards. Hamilton kick-off the second half as United look to extend their unbeaten run at New Douglas Park to six games. It looks like Stephen Hendrie, the Accies young full-back who is said to be attracting the attention of Celtic, is coming off at half-time. Trackside reporter Chick Young is suggesting that it could be an eye problem, with midfielder Louis Longridge being his replacement. "Hamilton Accies are going to have to come out and try to get back into the game. With their quality in final third, I think United can pick them off." Trackside reporter Chick Young is suggesting that the swirling wind on the pitch is spoiling the game as a spectacle. "It is difficult to play good football, but give the players credit for trying to play the ball," he tells BBC Radio Scotland's Sportsound. Liam Morgan: "I think he's having a look at Gary Mackay-Stevens, if you believe the papers." Only when they're right Liam! Mystery solved? Would the winger be a good signing for the watching Nigel Clough's League One club? Give us your thoughts? United just about deserve their half-time lead having had more of the pressure in a disappointing start to life as interim player-coach for Accies' Martin Canning. Dougie Imrie looks for an immediate reply as he steals in behind the United defence, but he is flagged offside as he batters a 12-yard drive off the legs of the goalkeeper. TV replays suggest the forward was just onside. Accies give Stuart Armstrong too much time and the midfielder takes full advantage with a precise, powerful strike from 22 yards. Goalkeeper Michael McGovern's reactions might also have been a bit suspect there. "The conditions are not bad, but neither team in possession looks anywhere near their best." It is Charlie Telfer's turn to squander a half chance as the United midfielder skews his first-time shot wide from just inside the penalty box. A fine through ball from Charlie Telfer presents Aidan Connolly with room behind the Accies defence, but the wee forward's chipped cross-come-shot evades the crossbar by a few inches when a ball across the face of goal might have found Nadir Ciftci unmarked. Simon Boendermaker: "I imagine he's taking a look at Andreu, which would be annoying as I'd have him at Pittodrie in a heartbeat." An Aberdeen fan there responding to our poser about who Sheffield United manager Nigel Clough is scouting tonight. The French midfielder has certainly been in scoring form this season. Any other suggestions? According to BBC Radio Scotland statsman John Barnes, these two sides have only ever fought out one 0-0 draw in 72 meetings. Hopefully, we are not heading for a second as we are nearly at the half-hour mark and neither side have seriously threatened a goal. Hamilton Accies FC: "Nigel Clough an interested spectator." One wonders who the Sheffield United manager is watching tonight. The 48-year-old has successfully raided the Scottish market previously - with some success - of course for the likes of Marc McNulty and Stefan Scougall most recently. Any thoughts who he might be interested in? Tweet me! United defender Sean Dillons fires the ball into his own face as he tries to clear under pressure near the corner flag and somehow gets a free-kick out of it. Maybe a wee shove from Mickael Antoine-Curier? A cross driven low into the Accies six-yard box by Stuart Amstrong and a low drive from Gary Mackay-Steven are cleared from in front of goal in quick succession as United exert some pressure. Accies fans have unfurled banners proclaiming departed manager Alex Neil as a legend and renaming him "Sir Alex". A little premature for honours from Her Majesty perhaps! Dundee United goalkeeper Radoslaw Cierzniak is left clutching his head after a challenge from Tony Andreu. Looks like a bit of an over-reaction there, but the Pole wins the free-kick. Nadir Ciftci has United's first sight at goal, but the normally clever Turkish striker is not so smart there as he rushes his effort and hooks it well over from just inside the penalty area. Accies goalkeeper Michael McGovern flaps a bit at United's first corner, but the home side get it clear. There will be a few interested parties up in Inverness tonight. Should there be a winner at New Douglas Park, the team taking the three points will overtake Caley Thistle and move into third spot in the Premiership. Accies will overtake them on goal difference even if they draw. An early chance for Accies and defender Jesus Garcia Tena rises above the United defence to meet an inswinging corner and ought to do better than head a couple of feet over from about eight yards out. Dundee United kick-off with fourth place and already a flare has gone off in front of the visiting stand. Hopefully it doesn't burn the pitch! The teams are now out on that artificial pitch I mentioned. Here's hoping for a goal fest like their 2-2 draw earlier in the season. With the gales and driving rain we've had, we should perhaps be thankful to Accies' artificial surface for having a game on at all. However, we are a couple of minutes away from kick-off. Dundee United manager Jackie McNamara has made three changes, with Blair Spittal, Charlie Telfer and Aidan Connolly - all aged 19 - in for Keith Watson, John Rankin and Chris Erskine, who all started on the bench. That could mean a change in formation too, with two midfielders and a forward replacing a defender and two midfielders. "I just felt for the match I wanted players on the pitch who are 100% focused on the job they have to do. "It is different for me in how I have prepared for the match and that's why I didn't pick myself. "It will take time and it was something that Alex found difficult at first as well. "The week has gone that quick that my total focus is on taking charge tonight. "I don't think there is anything to worry about with Darian, but we'll see how it goes." 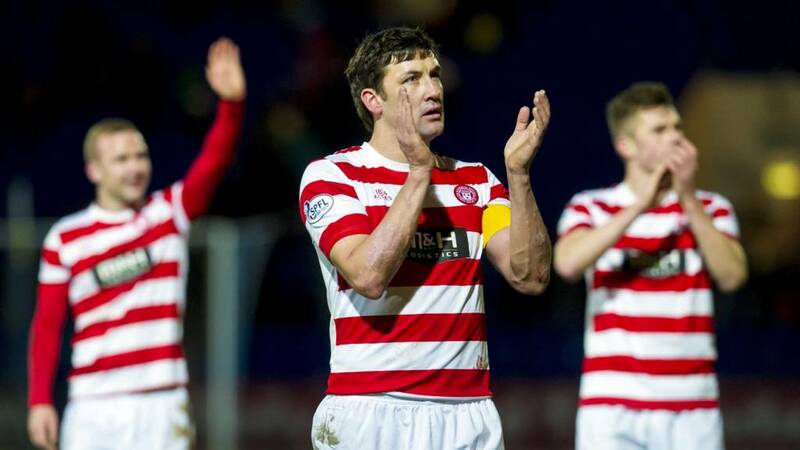 Martin Canning has decided to replace himself in the Accies defence with Jesus Garcia Tena. Hamilton looked to have a problem in the warm-up with midfielder Darian MacKinnon pulling up, according to trackside reporter Chick Young. However, he seems to have recovered and should be able to start. Hamilton: McGovern, Gillespie, Garcia Tena, Devlin, Hendrie, Imrie, Routledge, MacKinnon, Crawford, Andreu, Antoine-Curier. Subs: Canning, Watson, Longridge, Brophy, Docherty, Redmond, Hill. Dundee Utd: Cierzniak, Spittal, Dillon, Fojut, Townsend, Telfer, Butcher, Armstrong, Mackay-Steven, Connolly, Ciftci. Subs: Paton, Rankin, Watson, Erskine, Dow, Szromnik, Coote. Can Martin Canning win the Hamilton job permanently? Can either of tonight's teams keep up a title challenge? Give us your thoughts. One of Martin Canning's first decisions as Hamilton player-coach is to drop himself to the bench. Probably so he can concentrate on the management job rather than a lack of confidence. Charlie Telfer, who moved from Rangers during the summer, starts in midfielder for Dundee United and the teenager is being praised by manager Jackie McNamara.
" I think he is a special talent, so much touch and composure and we are giving him more in terms of strength and conditioning," he told BBC Radio Scotland's Sportsound. "He will be a great talent not just for us but for Scotland." "We need to win games like tonight before we can talk about putting in a title challenge. "Our away form has not been good enough so far. "Hamilton have done it for a number of years with some good young players and I have three teenagers starting tonight. "We saw at Kilmarnock that we need to win the physical battle first and hopefully the youngsters can do that." Hamilton will kick off tonight sitting in fifth place, one place and one point above tonight's visitors. Something must give at New Douglas Park, where Hamilton are seeking a third straight victory and their fourth consecutive three points at home. Dundee United are looking to extend their unbeaten run to three matches and have not lost to Hamilton in their last six meetings. Hamilton go into the game under new management. Since defeating St Johnstone 1-0 in Perth on 4 January, Alex Neil has headed south to become Norwich City manager. So defender Martin Canning, who like Neil is 33, faces his first game as interim player-coach. Good evening and welcome to our live text coverage of the last Scottish Premiership game of an extended weekend as Hamilton Academical host Dundee United. And it promises to be a cracker between two in-form sides.